What an unforgettable novel by Helen Klein Ross. WHAT WAS MINE is an intoxicating story about Lucy, a woman who can’t conceive, and makes a rash decision to steal a 4-month old baby from a shopping cart. For decades she gets away with this unforgivable act, but when her daughter finds out about her dishonesty Lucy is forced to flee to China to avoid prosecution. During her time in China Lucy’s daughter Mia has reached out to her biological family. Will she ever be able to forgive Lucy for her lies and deceit? I have to say that I’ve never read a story like this. WHAT WAS MINE was written unlike anything I’ve read. It’s told in several different POV’s which keeps the pace fast and the story interesting. I have to admit that I’m completely torn about how I feel about Lucy. She’s a kidnapper… plain and simple, but Helen Klein Ross does a wonderful job at showing both sides of the story. My heart broke for Marilyn, Mia’s biological mother, but as we read Lucy’s POV I found myself sympathizing with Lucy. For me, sympathizing with the “villain” is a sign that the author did a marvelous job at personifying the characters. Instead of just a vicious character in a story, Lucy was a human with a lot of faults. And Mia was a woman torn between hating the only mother she’s ever known, and loving her despite her dishonesty. 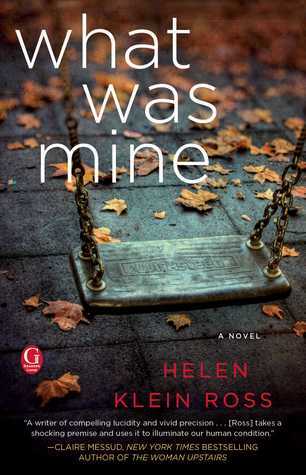 WHAT WAS MINE is a beautiful, electrifying story about kidnapping, love, and ultimately forgiveness. I read it in one sitting and I can’t wait to see what else Helen Klein Ross has to offer! Lucy Wakefield has accomplished everything she had wanted by her thirties except for one thing: Being a mother. She has tried everything and failed. Her husband doesn't want to adopt and soon after he leaves her for a younger woman who of course gives him kids. One day at IKEA, Lucy finds herself watching a baby girl alone in a cart with no signs of her mother. That day, Lucy commits a terrible crime. She takes the baby with her and for over two decades, she dedicates her life to her. To her dismay, secrets have a tendency to resurface and her daughter Mia learns about her deception and is devastated. Lucy runs to China when her world collapses, leaving everything behind and losing all hope. This story is powerful, intriguing and compelling. A few times while reading it, I found myself asking: What is wrong with me that I feel myself aligning towards the kidnapper and not that mom who loses her baby in the blink of an eye? I wanted Lucy to end up keeping Mia in her life. Marilyn didn't do anything wrong except losing sight of her child for just a few minutes, something I think almost every parent has experienced when their child is not in their sight for a few seconds and the worst thing comes to mind. There is not a specific reason why I leaned towards Lucy instead of Marilyn. Maybe it was knowing how much Lucy wanted a kid or the lack of friends or love she gave up in order not to attract unwanted attention to them. She feared getting caught most of the time. Her vulnerability was something I could relate to. I can recommend this book without doubts and I know I want to read more books by this author.